Ramboll’s Immersive Sound Studio (ISS) helps designers to model the noise and acoustics in spaces before they are built. The purpose built facility for auralisation; a technique akin to visualisation but in the sound dimension rather than the visual one, opened in December 2014 at Ramboll’s Blackfriars office in London. The Studio enables us to listen to the acoustics of spaces in buildings at the design stage before they are built. This is tremendous value to both clients and designers who can listen to a particular design and decide if it is successful or requires further adjustment. 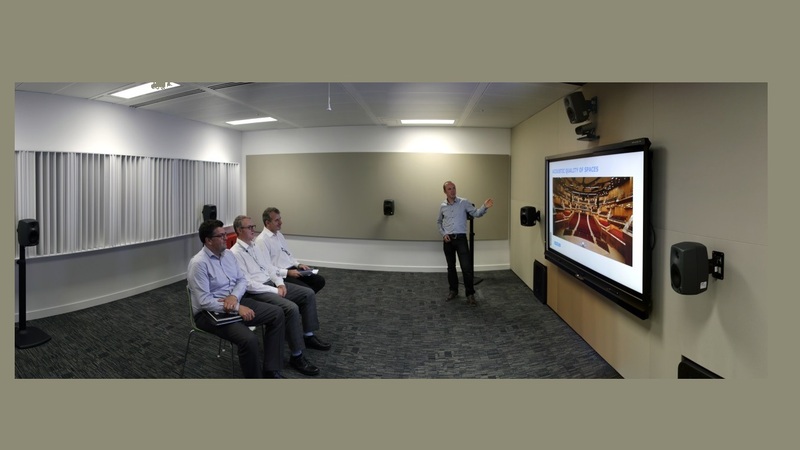 Investment in the studio opens up a major opportunity for presenting acoustic environments to clients in a way they can immediately appreciate and which enables them to make well informed decisions – be it the design of an opera house or an hotel. Prior to the Immersive Sound Studio at Ramboll, auralisations could be carried out using headphones or a portable loudspeaker which, although effective, cannot give the listener a full surround-sound experience in an authentic presentation. Although Ramboll carries out detailed calculations using finite element modelling, for example to predict the levels of train noise, clients cannot easily interpret these objective results in terms of a subjective audible experience – this is where “auralisation” steps in to give the listener an authentic rendering of the event as if she or she were present in the proposed space. The technique is of fundamental importance in the design of performing arts spaces such as concert halls and opera houses but it is also invaluable for assessing everyday noises in a wide variety of building types, including residences, schools, hospitals, hotels and commercial buildings. The Immersive Sound Studio has a very low level of background noise so that even the quietest sounds can be discerned. The walls and ceiling are treated with a combination of sound absorbing and sound diffusing surfaces to provide a neutral acoustic space, allowing the listeners to hear the smallest detail. The sound being auralised is produced by an array of studio quality loudspeakers which surround the listener who can also view an interactive video screen with images of the space under investigation. A frequent application of the Studio facility in London is for the auralisation of structure-borne noise from railways. Major infrastructure projects such as Crossrail and the Northern Line Extension can affect residential and office buildings. Auralisation enables property developers and tenants to experience whether the rumble from passing trains is sufficiently low to avoid disturbance or not. The implications to the design of the buildings are major as mitigation measures such as isolating a building on resilient bearings can be a costly process. Where an auralisation can demonstrate that disturbance from trains is minimal, a big saving can be made by the developer.